-One of the pair of rabbits that live across the alley from Sue's garden...why she plants lettuce in boxes on a garden shelf! 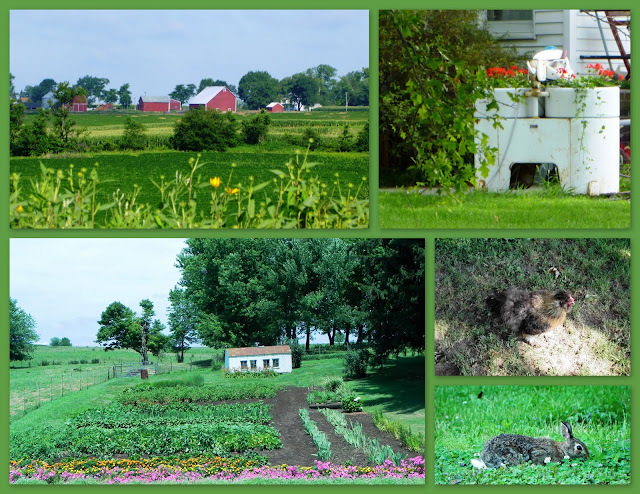 -This beautiful Amish garden near Frytown north of Kalona, Iowa...like Grandma's with rows of flowers in front of the perfectly kept vegetable garden. A taste of why we live here. Shimmering heat and yet you must be getting enough rain . . . so lush and green! More than enough at times. However it was when it was needed. I was recently in Wisconsin and it was much the same. Lush green fields, gorgeous blue skies, and huge puffy white clouds (love those Midwest skies)! I'm happy the Midwest is getting its fair share of rain. But we will share our fair share of tornadoes with all of you. We are in for a few days of rain and cooler temps and that is fine with most of us. Hot and dry for Harvest would be nice though. Guess Mother Nature will do what she wants to though. Hope everyone has a great weekend. This evokes so well my memories of summer at my grandparents' farm - the hot, clear sun, the country swimming-pool by the tennis-courts near the little school, the vegetable garden lush and abundant with well-tended crops in season that had a flavour like no shop-bought ones ever will. And raspberries, gooseberries, lilies, sweet-william, roses, delphiniums blooming, scents of hay and nearby sheep, sounds of poultry, and seeing rabbits in the long light evenings. Happy days! What I find so nice is how many people still cherish and/or live this life style. In today's hectic pace we all need that lovely quiet memory.